This is the first of the three boxes I picked up on my second day at the Gibraltar Trade Center card show a few weeks back. Even though this was a retail box, the price was good so I went for it. I've bought a few packs of this stuff in the past and always liked the base design, especially the column designs on the sides of the card. The foil around the player name adds a nice touch as well. Nothing spectacular here, just a base card with the foil swapped for silver and a serial number added. I guess it's not all that bad to get one from a retail box, so I'll take it. These aren't all that bad, but I think they could have been much better. They could have at least came up with a new foil pattern for the bottom or something. What do you know, another no name rookie for me. 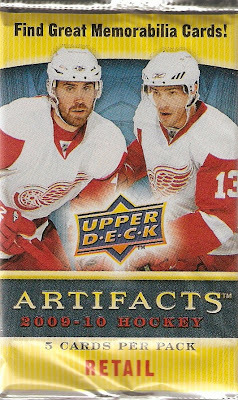 That seems to happen a lot, but what can I expect when I buy a retail box like this? Again, same with the Legends, why couldn't they have changed up the bottom of the card a little bit? 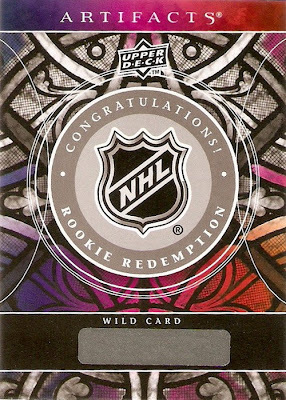 It's pretty bad when I like the design of a redemption card more than actual cards from a set (i.e. the Legends and Rookies). 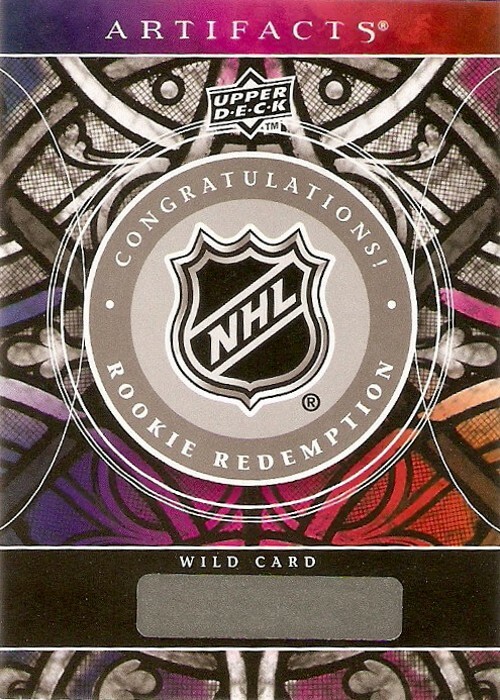 I already redeemed this one and it turned out to be Jason Demers of the Sharks, so another no name rookie for me. I didn't know what to expect memorabilia wise from a retail box, but I wasn't at all disappointed to find this Treasured Swatches of Alex Kovalev. 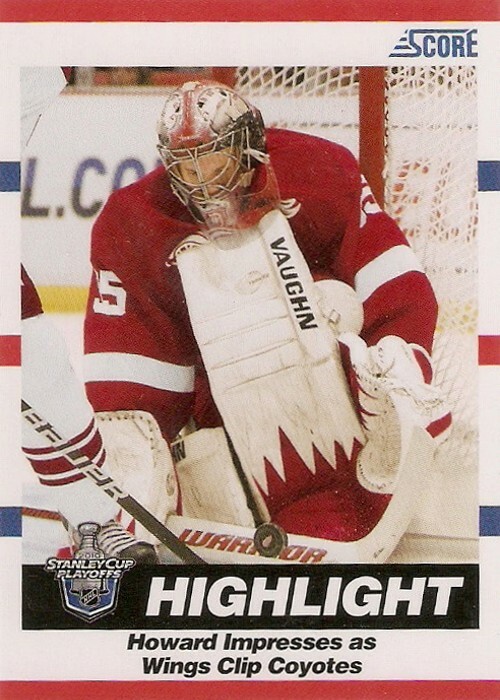 I just wish they would have left the Montreal logo on the card. The Senators stuff just makes the card look bad. 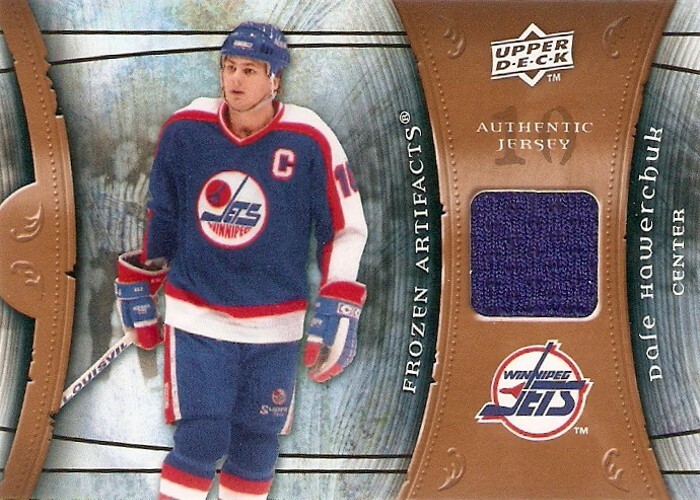 This Hawerchuk Frozen Artifacts was also a nice surprise coming from a retail box. 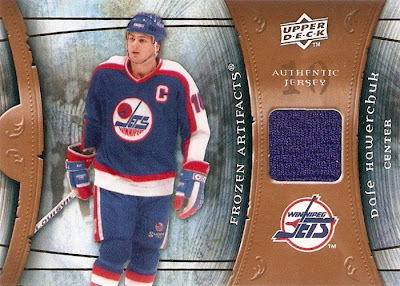 Although it's not as big an issue on this one, I wish they would have used the old school Jets logo instead of the newer one. All in all, this was a decent break. I got a lot of nice base cards and a few nice inserts. 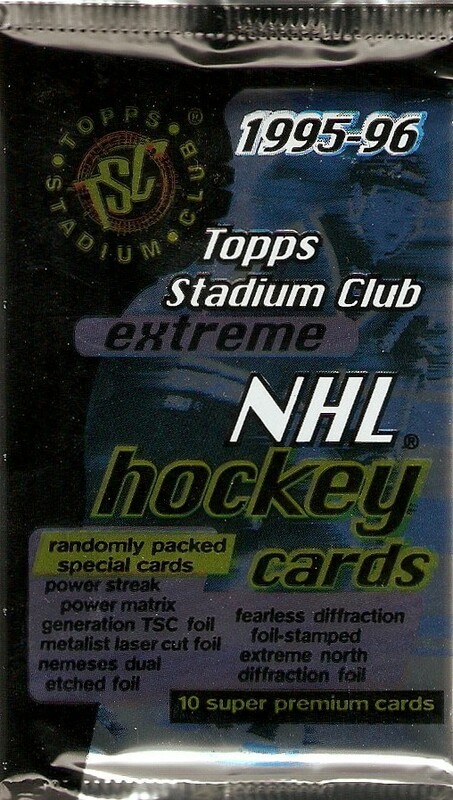 I wouldn't mind picking up a hobby box of this stuff in the future if the price was right. I haven't had much time for this blog lately, but I wanted to get another one of these posted while I have some time. 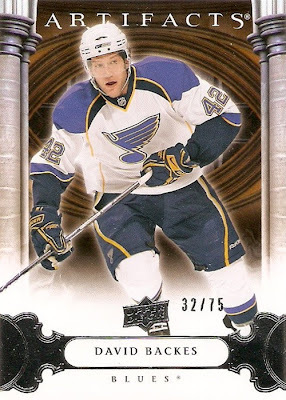 This series is for any card, whether it's an epic hit or just a measly base card. This one would be the latter. It's a Ron Tugnutt from the 1995-96 Score set. This is just another one of those cards that caught my eye when flipping through the pages in one of my many binders. I like when base cards have a closeup of a goalie's mask like this, it's something you don't see all the time. First, let's look at the mask. I love the splash effect. 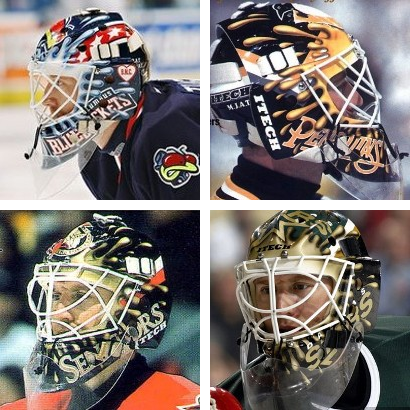 It's unique and that's what goalie masks should be about, distinguishing themselves from the others. 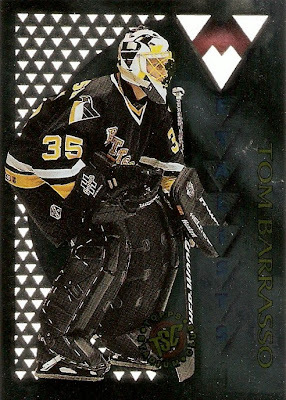 What I like about this design is that he carried it over to other teams. Here are some of Tugnutt's other splash masks. As you can see they all have the same splash effect, accompanied by the team logo right on top and the team name up the two sides. Of these five similar mask designs, I would have to say the Columbus design looks the best simply because of the color combination. 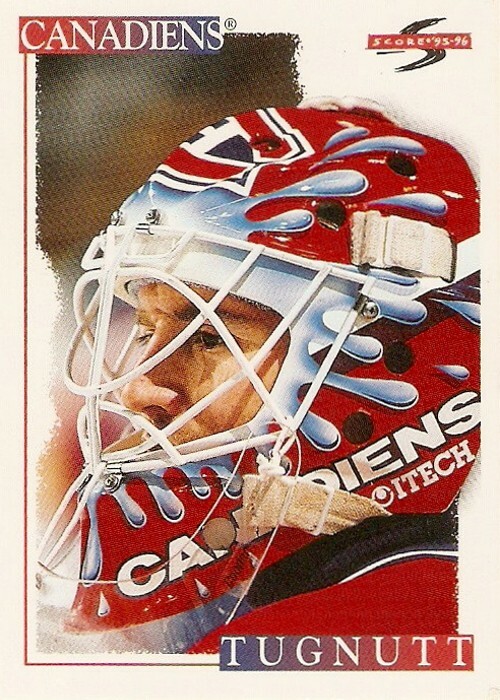 Other than Johan Hedberg and the Moose, I wonder how many other goalies carry their basic mask design from one team to the next like this? A few come to mind like Kolzig with his Godzilla mask in Washington and Tampa, or Lalime with his Marvin Martian masks, then there's Turco in Dallas and Chicago too. This was the box I picked up the first day I was at the Gibraltar Trade Center card show a little while back. It was sitting in a bargain box pile for only $6, so I figured what the heck, why not? 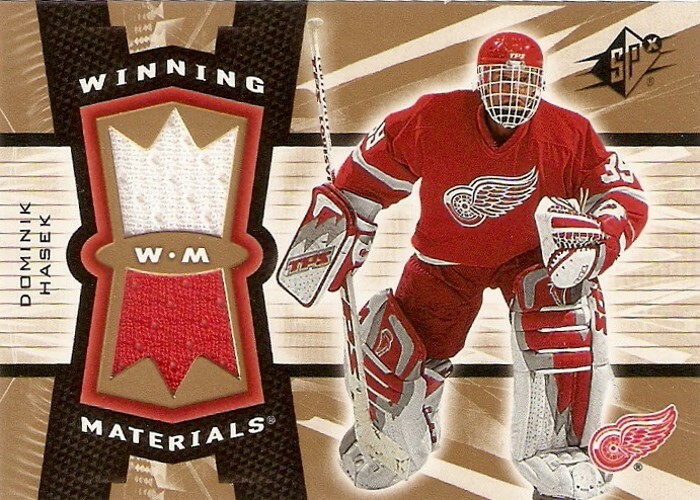 These kind of boxes are always fun to bust as these were the "in" cards back when I got into collecting as a kid in the 90's. And how can you go wrong with ten "super premium" cards per pack? Let's take a look at what was inside. The base design for this set is pretty simple. I like how the upper 80% of the card is left unobstructed. I also like how they used the 3D puck and wrapped the text around the outside of it. That definitely gives it a 90's vibe. These are so extreme it's almost hard to read the text from the scan. I don't think the neon purple was the best choice of color in this case. It's kind of weird seeing Bert with the Isles though, as he only spent his first two seasons there. These are a bit easier on the eyes than the rookies, but still just as extreme. 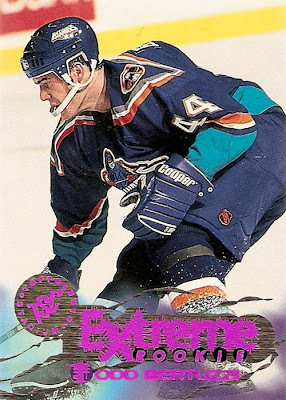 I think I can count the word extreme at least twelve times on the front of this card. One thing I do like about it is how they make the player image stand out from the background. 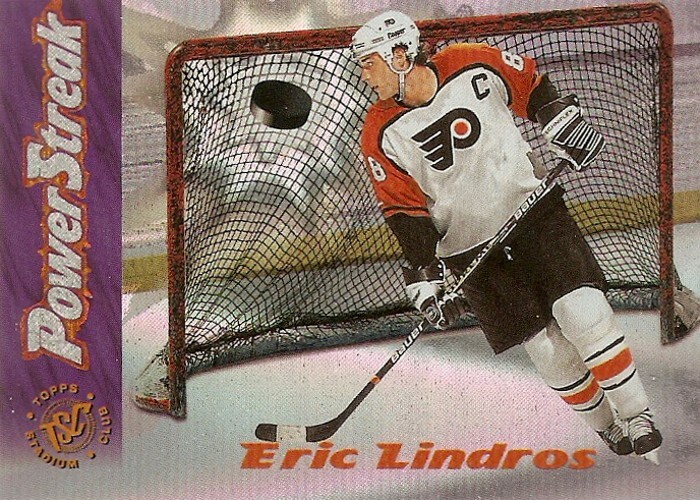 This is another one of those mid-90's inserts that does not scan very well. I'm not exactly sure what the point of this set is, but they don't look all that bad. These are kind of cool as they showcase two players at the same time, in this case Ray Bourque and Brian Leetch. Again though, these cards are not the most scanner friendly. These are probably my favorite of the bunch. They focus on the trophies that each player has won in their career. I really like the die-cut pattern on these cards too, it's something you don't see everyday with that many small cuts through the card. These are kind of neat. I really like how the words are raised in the background around the player images. 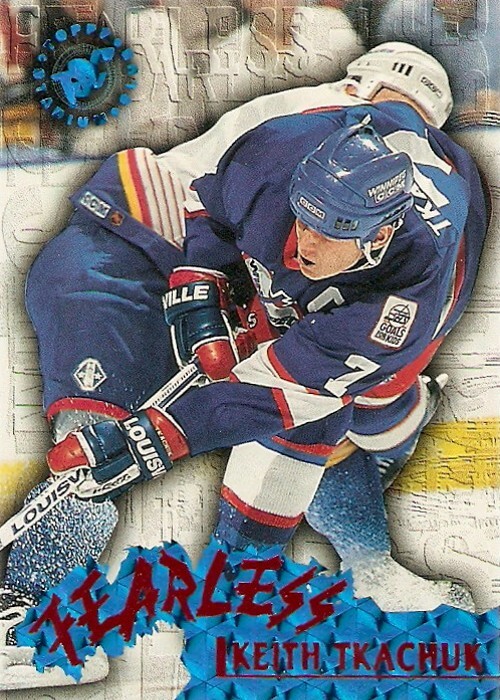 The blue and red foil at the bottom is kind of cool and I like the font of the word fearless. Another set that definitely has that 90's feel to it. I remember thinking these were so cool when I was a kid, but now they just look weird. They could have at least added some depth to the net or something. All in all this break was enjoyable and well worth the $6. I got a lot of base cards of guys I grew up watching on TV in the 90's, so that was nice. 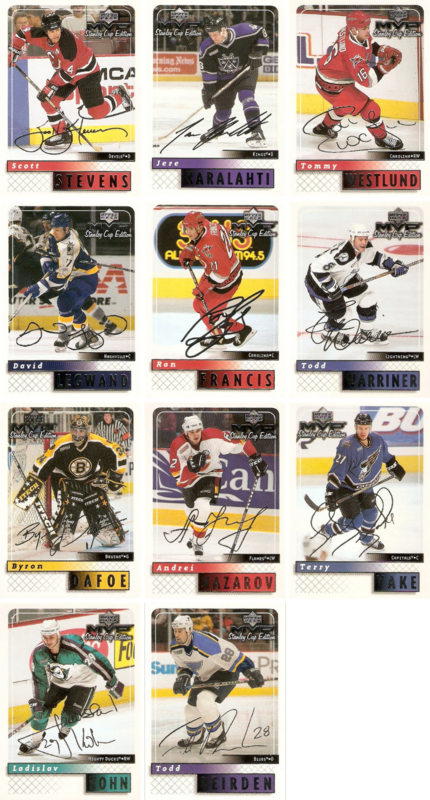 Then there were plenty of typical 90's inserts, nothing spectacular, but nothing as bad as some of the inserts of today. Now this is more like it, two Super Scripts in the last two weeks. I am learning more and more though, that I will most likely see any given card from this set only once, which means I have to jump at every opportunity to add one to the collection. 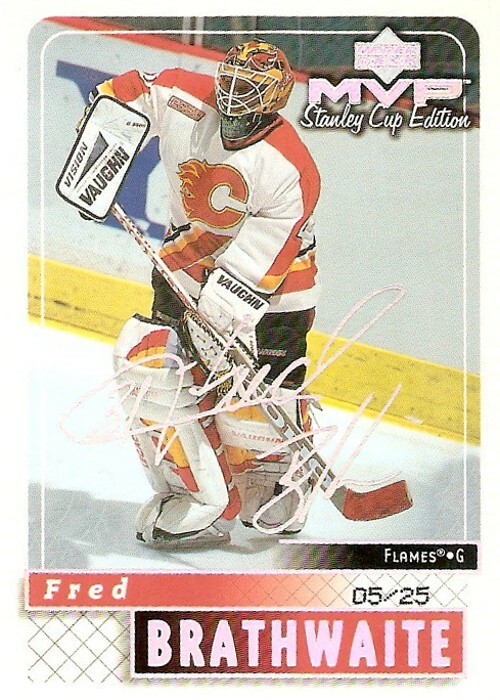 This Fred Brathwaite numbered 05/25 is the other one I was referring to in my last post. It was up for grabs for $15, so I couldn't pass it up. This one, like the Sean Hill, had been up for grabs for quite a while when I pulled the trigger on it. This one also comes from a place where I haven't bought from yet: CheckOutMyCards. I was weary of purchasing from this site as I haven't in the past, but it worked out and I now have 16 Super Scripts in the collection. Brathwaite is only the second goalie I've added to the Super Script collection next to Dominik Hasek. He is also the first Flame in the collection. Maybe a goal for this set could be to get at least one from each team. That's probably more attainable than the entire set itself. 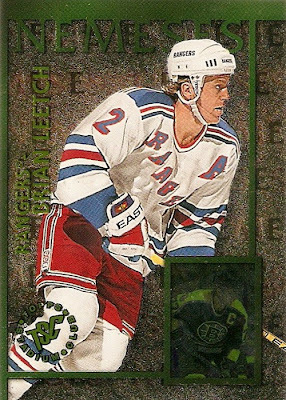 As far as continuing the set, I'm currently trying to work out a trade for a Brian Leetch, hopefully it works out. Other than that, if you have one or ever come across one of these, I would really appreciate any information, as they are getting harder and harder to find. It's been about two months now since I've added to my Super Script collection, although it seems like forever. It has been even longer since I first came across this latest pickup though. This Sean Hill numbered 02/25 has been on the bay for at least the past six months now at an $18.95 buy it now. I never wanted to pay that much for it, so I decided to throw an offer of $12.50 to keep the total at $15 with shipping. Needless to say, the offer was accepted, bringing the Super Script total to fifteen. These things are getting harder and harder to find as time goes on. 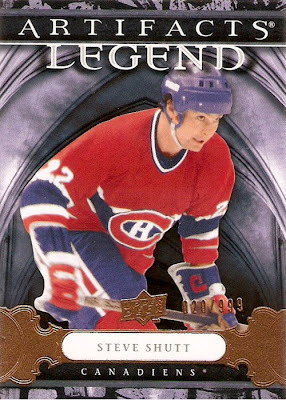 I've only seen this and one other one for sale anywhere on the internet lately, and I didn't come across a single one at the last card show I went to. I had to pay a little more for this one than in the past, but it's still another one to check off the list and that's all that matters. Even though these are just simple parallels from ten years ago, I still think they look awesome together. The different team colors really stand out when you see them all next to one another like this. Now I want to come up with a way to frame them so they're not just sitting in a stack in my desk drawer all the time. Maybe something like 20 per frame, so I don't need to worry about a single frame for 220 cards, if I ever were to complete the set. Anyone have any suggestions on how to go about displaying a large set like this? While I was at the card show a little while back, I made my first significant in-person trade. 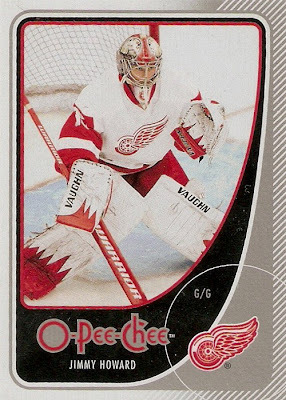 I unloaded eight or so cards I had no interest in for a few nice pieces for my Dominik Hasek collection. I'm not going to get into what I traded for these, as I do not really care about trading for book value. All I know is I got rid of some cards I didn't want, and picked up a few that I really wanted. Works for me. The first one I got is this game used stick from 2001-02 Upper Deck Top Shelf. 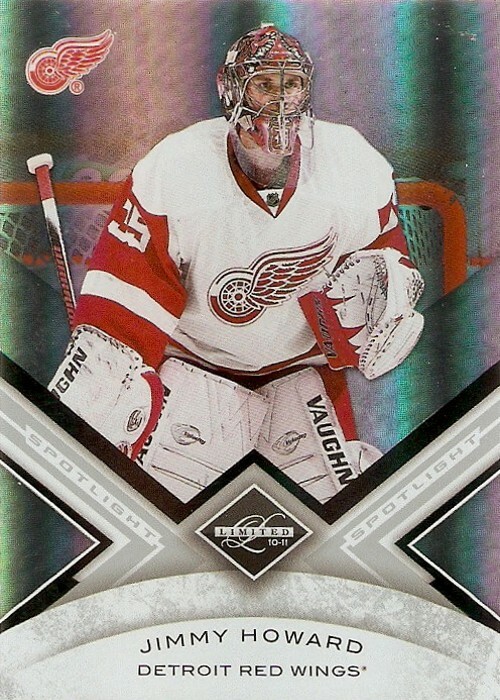 Stick cards are nice, because there are far fewer of these than plain jersey cards. As an added bonus, this one is just barely three colors, where a lot are either one color or just wood grain. This next one is probably my favorite of the three. It's a triple game used jersey from 2006-07 Between the Pipes. 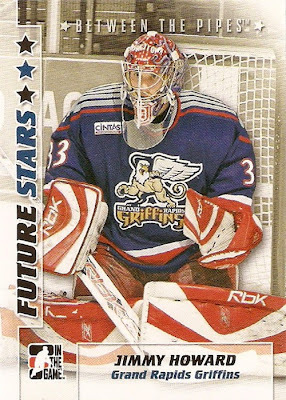 What I like most, is the fact that it has a swatch from Buffalo, Ottawa and Detroit. 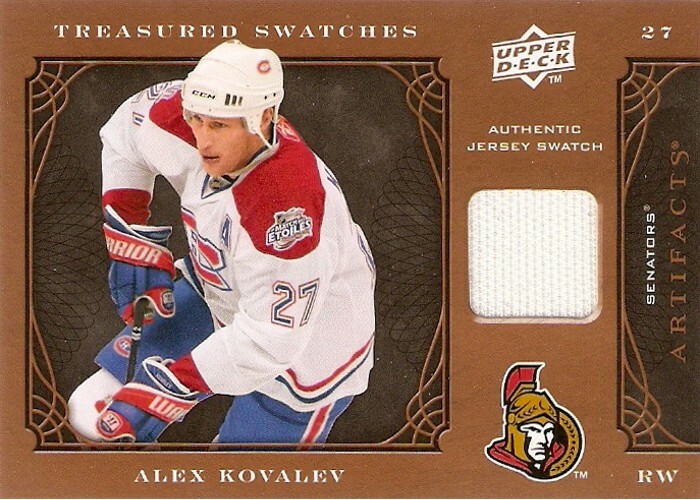 The huge seam on the Ottawa swatch is pretty cool too, although it kind of makes the surface of the card a bit uneven. 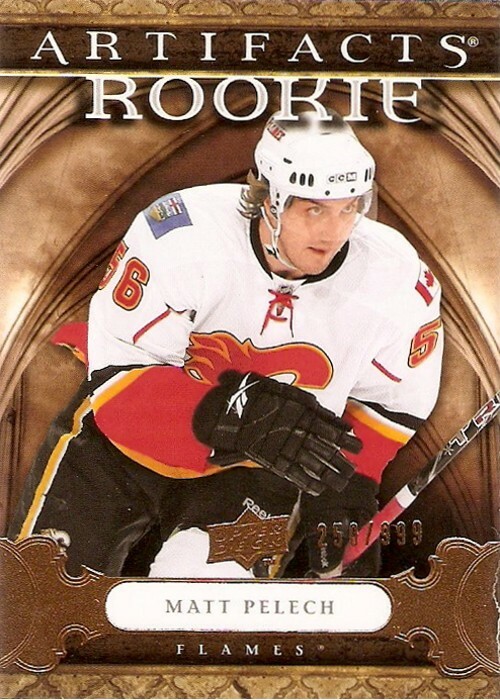 The last one is another nice dual jersey card from the 2006-07 SPx Winning Materials set. I like that one swatch is red and one is white, so they at least match the Wings jersey Hasek is pictured in on the front of the card. 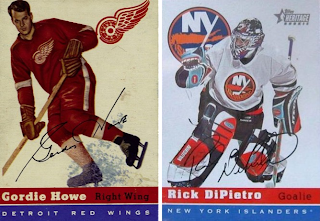 These three bring me to four total memorabilia cards in the Hasek collection. I know that doesn't sound all that impressive, but it's still nice to have them. 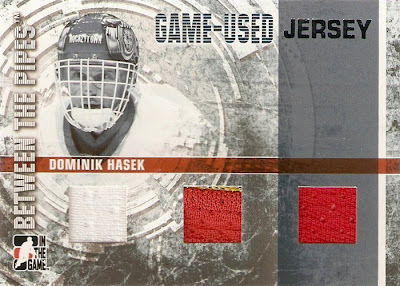 Now I just need to get an authentic Hasek auto, as I already have one I got through the mail a few years back. 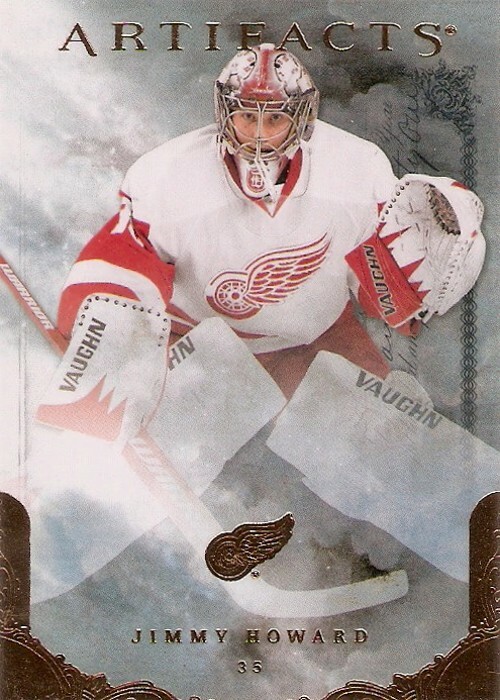 It's been forever since I picked up any cards for my Jimmy Howard collection. One of the things I wanted to do at the last card show was add some singles. I only found a few that weren't over priced, as it was a local show and Red Wings cards are always overpriced. 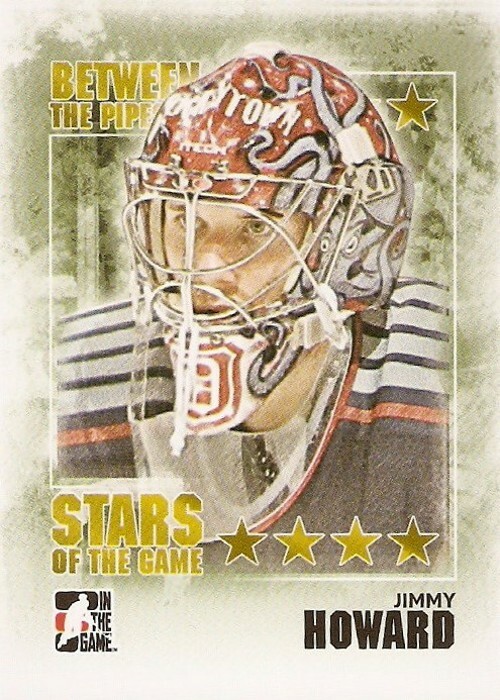 This first one actually came from the 2007-08 Between the Pipes box I bought the second day of the show, but it is still another one I didn't already have. It's got a great shot of Jimmy playing with the Grand Rapids Griffins. The second one I found in a $0.50 box and had to have it. 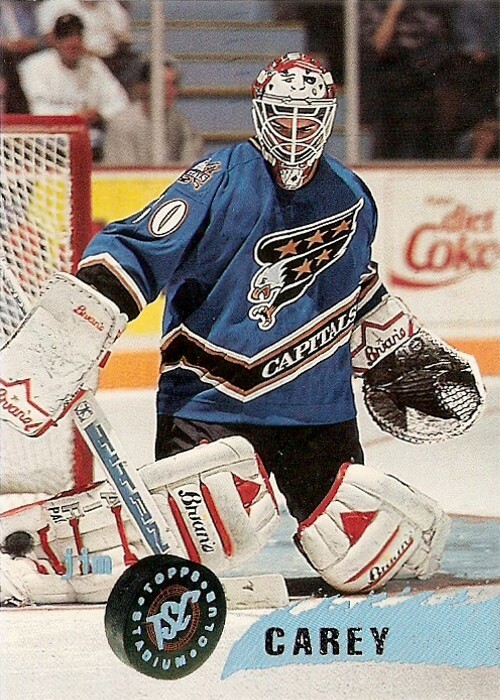 I really like the mask he had back then, with the octopus on either side and the old school D on the front. These next three came from the bay. 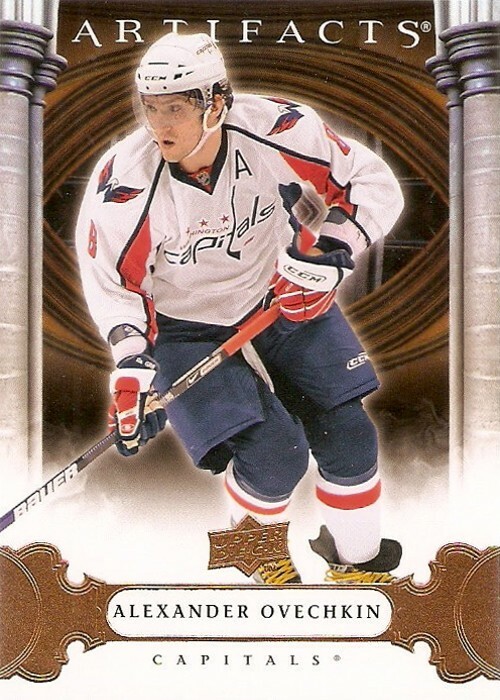 The first is a 2010-11 Limited Spotlight numbered 38/49. 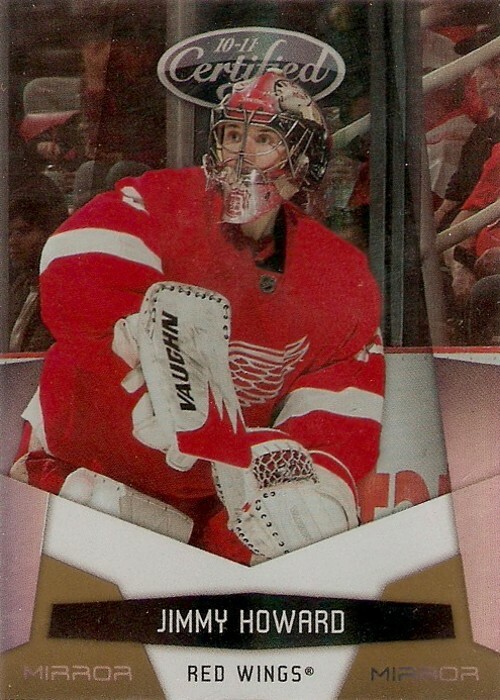 It's another one of those Panini parallels that look nearly identical to the base set. I do like that they have a shot of his Doc Oc mask though, it's the first card I've seen with it. The next two are from Certified. They're the exact same card, but the sticker on the second one shot the price up by $20. The non-auto is numbered 07/25 and the auto is numbered 11/25. They definitely look a lot better in person than in the scans below. 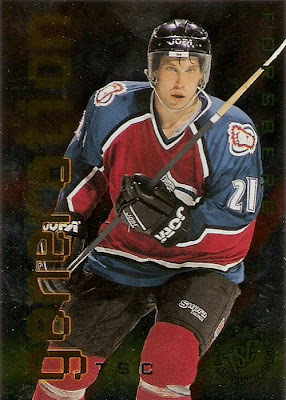 Earlier, I mentioned that I completed a trade with Chris over at Confessions of a Hockey Card Addict for some Silver Scripts. In addition to the ten Silver Scripts, Chris was kind enough to throw in three Howard base cards from 2010-11: Artifacts, OPC, and Score. 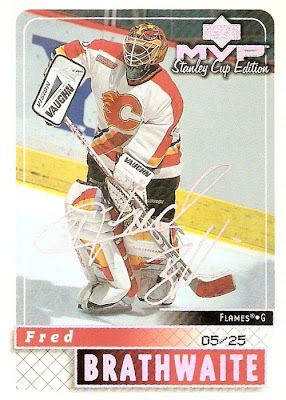 It's been a while since I've added to any of my MVP Stanley Cup Edition Script sets, so this latest lot of Silver Scripts was a welcome addition to the collection. Part of this pickup was also my first real trade, something I want to do more of in 2011. I picked up the first ten in a trade with fellow hockey card blogger Chris over at Confessions of a Hockey Card Addict. If you haven't already checked it out, what are you waiting for? The Rierden I just happened to find when searching through another stack of cards on my desk at home. These bring the Silver Script total to 56 out of 220. Not bad, this puts me more than 25% of the way there. It's been quite a while now since I've been able to share any of my custom card designs as I've just been far too busy with finishing up college and starting my new job. To help keep these coming faster, I've decided to focus on sets of nine cards at a time. I also want to change up the format of these posts. Instead of just showing all nine of them together, I want to take one and show a larger image to describe the details of each design. Also, if my design is a recreation, I want to show the original as a comparison. For my latest creation, I settled on recreating the 1954-55 Topps set. I decided to do this set after coming across some 2000-01 Topps Heritage cards while searching through my collection, which are based on the 1954-55 design. As you can see, there is not much difference between the two, other than the background color and the size of the team logo. 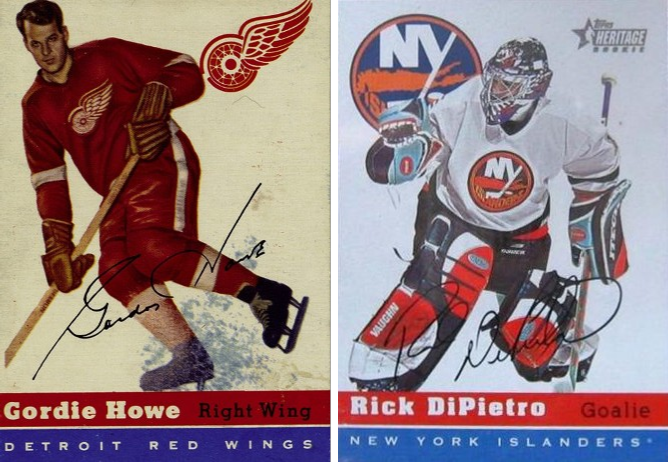 Both sets have the sprayed ice effect, it's just not used on the DiPietro. Despite how simple these cards look, they actually took me quite a while to put together with Inkscape. I started with a 500 x 700 px background and made that the nicer tan color from the original 1955 set. I then added the blue and red bars across the bottom, right on top of the background, also with the 1955 colors. Surprisingly, it wasn't all that difficult to find fonts that matched the originals. I ended up using Playbill for the player name, Rockwell for the position, and Arial for the team name at the bottom. The next step was choosing the images I wanted to use. I couldn't use just any picture, as I had to be able to center them to some extent, so this took a little bit of searching the internet for the right ones. Once they were all chosen, I needed to import them into Inkscape and manually clip the player from the background. After that, I decided to add the shadow effect behind the images, just to do something a little different. One thing I really wanted to use was the facsimile autographs. This was slightly difficult because I had to import an image of each signature and manually trace it. This allowed me to keep them all the same color and line weight. The last step was adding the team logos. I made them a bit smaller than in the other two designs, only because I didn't want them to interfere with the player images at all. A little extra effort on this custom set definitely paid off as I think it is the best I've done so far in terms of recreating existing set designs. I only have the nine as of right now, but I may end up deciding to do the full 27 like I did for previous recreation projects. As planned, I made it out to the same card show again for a few more hours today. It was a bit busier and there were several additional dealer set up compared to yesterday. 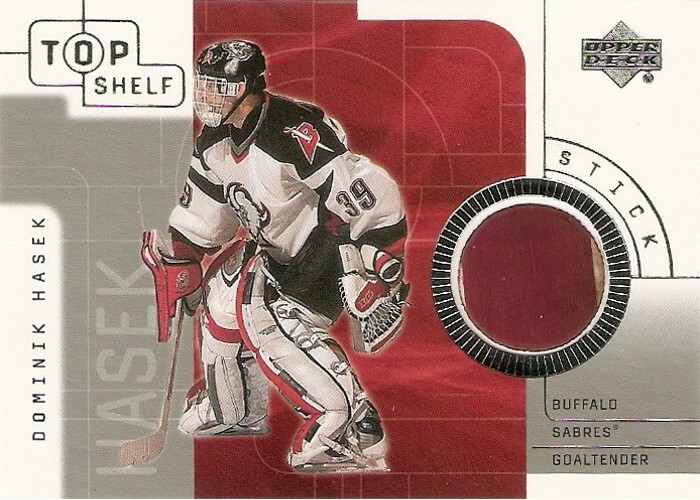 I also made a nice trade for some excellent additions to my Hasek collection. I'll get into the details of these pickups later. In addition to these, I scoped the place out and have a plan in place for what I want to pick up when I head back there tomorrow.